ClubCoins Nødvendigt: 312 Software is not compatible with mobile and tablet devices. Please add this title to your Wish List and sign on to your the first club account from a desktop computer to complete your redemption. ABOUT THE SOFTWARE Available Languages: English Russian English German English Spanish English Portuguese English French English Italian	PROMT Home 11 is a convenient and easy-to-use translator for all occasions. It is a great helper for work, studying and communication in foreign languages.Key benefits	New level of translation quality Improved translation algorithms, updated… dictionaries and unique PROMT translation technology, provide the best quality of machine translation from and into English. Convenience Try a new PROMT Agent plug-in! Simply select a word or a text fragment in any program or on any web site, click a hotkey, and the resulting translation will appear in a popup window. MyPROMT The personal user section allows you to download updates, to participate in events, and exchange dictionaries. Confidentiality To translate, you don't need an Internet connection. Your personal data and any translated information will not be disclosed to the third parties. Use PROMT Home 11 to: Communicate with people in international social networks and Internet communities. Quickly grasp the overall idea behind texts and documents written in a foreign language. Translate with minimum effort in any Windows-run program or application. Translate Web sites in Internet Explorer and Mozilla Firefox.KEY FEATURES	Translation in any application	One word or a whole text, in the PROMT interface or in any program – translate with one click! Simply select a word or a text fragment, click a hotkey, and the resulting translation will appear in a popup window of PROMT Agent. PROMT Agent will help you to be quick on the uptake on any website and view information in documents of any format instantly!Translating Web sites in Internet Explorer and Mozilla Firefox	Do you want to translate international news yourself? Do you want to translate the lyrics of an international hit? Do you want to know what the fans of a foreign sports team talk about on their forums? Are you planning to make purchases from abroad? 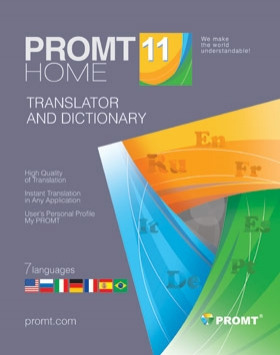 PROMT Home 11 comes in handy whenever you want a foreign Web site to speak your language. PROMT Home 11 builds translation options into popular browsers such as Internet Explorer and Mozilla Firefox. The translation of the Web site of your choice is just one click away. What's more, all the formatting and hyperlinks will be preserved.Translating texts	With PROMT Home 11 you can quickly translate an entire text without wasting time looking up words. Its easy-to-use two-window editor will quickly translate texts into your language and back. One window displays the original text, the other the translation. PROMT Home 11 guarantees the basic-quality translation, which helps you understand the gist of the text and its relevance to you. Why do you need a basic-quality translation? To save time: you'll be able to decide immediately how interesting or relevant the information in the text is for you. Note: To translate specialized texts we recommend enabling specialized dictionaries.Universal dictionary If you need to look up individual words, you will always have access to a dictionary with translation variants and grammatical assistance readily available. You can create your own dictionary, for use either manually or automatically. This feature is very convenient for anyone learning a new language!To extend the basic capabilities of the application, you can purchase additional collections of PROMT domain-specific Dictionaries. WHAT'S NEW	New in PROMT Home 11Improved translation algorithms, updated dictionaries and a unique PROMT translation technology provide the best automatic translation from and into Russian.Use a unique PROMT Agent plug-in to translate highlighted text in any Windows application.To install PROMT Agent: Launch the PROMT main application. Click the PROMT Agent icon. Follow the instruction on the screen.Updated functions of automatic identification of document's topic and type.SYSTEM REQUIREMENTS	500 MHz Pentium processor or better	At least 64 MB of RAM SVGA or better video card and monitor	Operating system: Microsoft Windows 10 Microsoft Windows 8 Microsoft Windows 7 Microsoft Windows Vista Microsoft Windows XP Professional with Service Pack 2 or higher Microsoft Windows 2000 Professional with Service Pack 4 NET Framework 3.0 (installed automatically)Plug-ins with translation capabilities are supported for the following third-party applications: Microsoft Internet Explorer v8-11 Mozilla Firefox v24 © PROMT, 2003 - 2016 . All rights reserved.